This one’s for Kathy. While taking this picture, I found the one known physical flaw (yes, yes, operator error is inherent) in the new camera. The bigclunkyoldone had an advantage in its flip out and around screen. 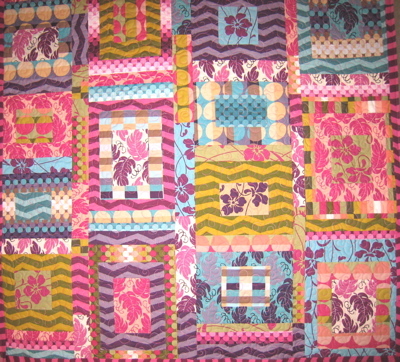 There is no available vertical space, so larger quilts are photographed on horizontal, say, queen-sized spaces (op. cit. yada yada yada). It is nearly impossible to square-up the pic you’re taking while standing on a chair, arms extended over the approximate center of a quilt, craning your neck to see if you can catch a glimpse of the screen. Yeah, well, it’s all rocket science variety over here. And, speaking of those lovely quilters I’d like to move in with in Australia…this falls into the Little Known Facts category: both of the dogs (and their hair) residing with us are ALLEGEDLY mixtures of Australian shepherd and Boston terrier. Do you see it???? Maybe this should be classified in the Bill of Goods category. Oh, the quilt above is made from Free Spirit’s Utopia. Free pattern: here. OK, out of my way, I have an eBay auction to watch… If things go well, I’ll show you that later! No sniping!